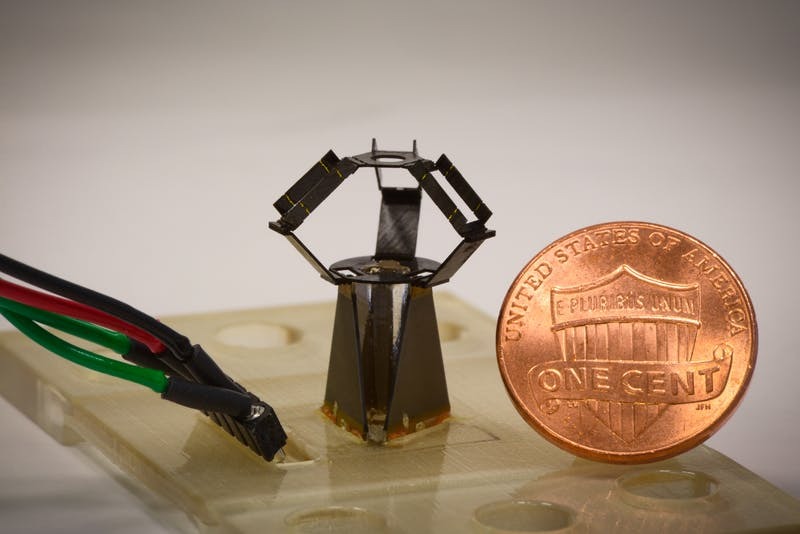 It takes the traditional three articulating arms of a “pick and place” Delta Robot and miniturises them to a millimeter-scale version, hence the “milliDelta” name. As reported in Science Robotics, the new design has actually been developed by Robert Wood’s team at Harvard’s Wyss Institute for Biologically Inspired Engineering and John A. Paulson School of Engineering and Applied Sciences (SEAS). To give it proper credit. The Wyss team has apparently already demonstrated that the milliDelta can work in a space of just seven cubic millimeters. It could apply forces and exhibit trajectories – together high frequency operation – that could make it ideal for “micromanipulations in industrial pick-and-place processes and microscopic surgeries such as retinal microsurgeries performed on the human eye”. “Possible applications at this scale include microassembly, micromanipulation, and tremor cancellation in microsurgery. Our design is powered by three independently controlled piezoelectric bending actuators. Thanks to Sue P. for highlighting this one.